bar none group: ¡Que viva Lila Downs! 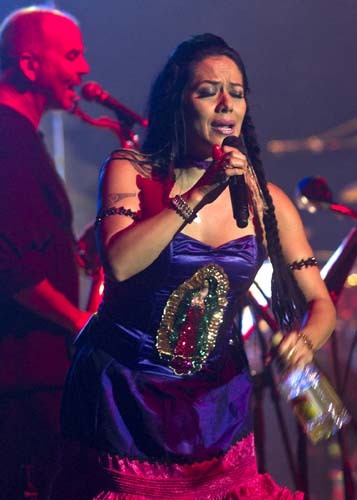 Lila Downs delivered a performance de coraz‪ó‬n, or from the heart, Saturday night at the Congress Theater in Chicago. Downs is on tour with her new album Pecados y Milagros or Sins and Miracles. A standout song from the album is "Pecadora." The song has notes of ska, klezmer and rap with lyrics in Spanish. She also did a beautiful rendition of "Cucurrucucu Paloma." It's classic Lila as her musical influences come from around the world starting in her mother's home state of Oaxaca in Mexico, north to her father's Minnesota and beyond. It's hard to describe her music with global influences. She is not only defined by Mexican or American culture. The beauty of seeing her grow with each album is how she crosses borders and brings in new cultural influences from the Middle East to Africa while singing in English, Spanish and in Mexico's indigenous languages. She reminded the audience there are 64 such indigenous languages in Mexico. Her albums over the years also have called attention to human rights and immigration issues. She is not preachy but her music gives voice to issues often overlooked. I've seen Lila Downs perform more than a dozen times dating back to the mid-90s at jazz clubs in Mexico City. I've also seen her perform at festivals in Guadalajara, Mexico, and in Chicago several times too. She also gave a stellar performance when I saw her perform at Carnegie Hall last fall in New York. There she was joined by a mariachi band and she belted out some of the classic rancheras and boleros. At the Congress Theater show, Downs moved the audience with her versions of classics "La Llorona" and "Paloma Negra." Her range is phenomenal from the highest cries to the lowest note. Downs, who wore a sequined Virgin of Guadalupe on her purple dress, is loved in Chicago. She sings and celebrates the cultural pride of Mexico yet like many of us she is not defined just by one culture. She takes the best of many cultures and celebrates them through her art. The audience begged her for more at the end of the performance. She gave three encores and the crowd cried with excitement. She shouted back, "¡Que viva Chicago!" I say, ¡Que viva Lila Downs! P.S. Special thanks to my friend Olga Lopez for the photo from Saturday's show.